Senior Max Tennant, captain of the Ohio Wesleyan University men’s lacrosse team, presents a jersey to Gabriel Eberhard, while Gabriel’s mother, Mary Beth, looks on during a ceremony held Tuesday at OWU. 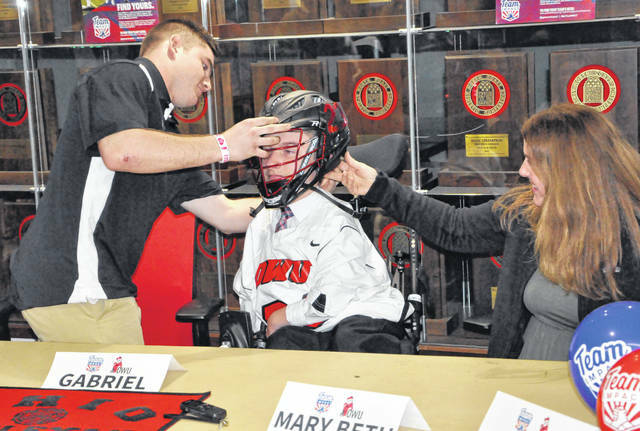 Gabriel Eberhard is outfitted with his own lacrosse helmet on Tuesday at OWU. Present to make sure the helmet fit perfect was his mom, Mary Beth, along with OWU senior and team captain Max Tennant. The Ohio Wesleyan University men’s lacrosse program added an important piece to the puzzle on Tuesday by way of a special recruit. Twelve-year-old Gabriel Eberhard, of Marengo, signed his letter of intent to officially become a Battling Bishop in a ceremony that included family and current players and coaches of the OWU lacrosse team. Eberhard, who was diagnosed with arthrogryposis multiplex congenita at birth in 2006, was presented with his own jersey and helmet after a ceremony in which he talked about his new team and fielded questions from the crowd. Eberhard added he felt the team would a great one moving forward, which drew loud applause from all in attendance. However, the loudest applause came when Eberhard was asked by a teammate what he was most looking forward to as a member of the team. Eberhard’s father, Ryan, said he has already seen new energy and fire in his son’s spirit since joining the team, and he expressed thanks to the program for welcoming his son to the team. “You guys are something special,” he said in addressing his son’s new teammates and coaches. The email went on to say Eberhard is self-determined, thrives in adversity, and always perseveres, even when the odds are against him. The email closed by stating that Eberhard has been dedicated and responsible throughout all his surgeries, which has exceeded 30, and he understands that responsibility is the key to his success. Plantholt said he was sold on Eberhard being the perfect fit for the OWU men’s lacrosse team from the moment he read the email. When asked what will be asked of Eberhard moving forward, Plantholt continued to stress that what will be asked of Eberhard will be no different from anyone else in the program. Senior and team captain Max Tennant called the addition of Eberhard a “huge honor,” and he said that Eberhard has brought a positive attitude that has been infectious to everyone in the program. 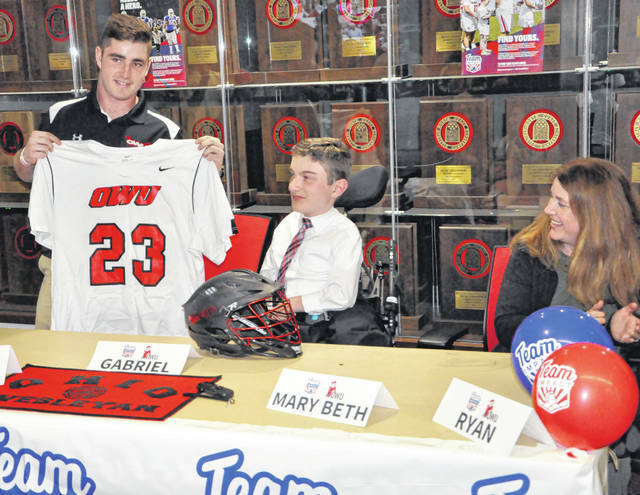 Eberhard joining the OWU lacrosse team was made possible by Team IMPACT, a national nonprofit headquartered in Boston. Team IMPACT brings children facing serious or chronic illnesses together with college athletic programs. Through the pairings, Team IMPACT hopes to build the child’s support system while teaching student-athletes about true life lessons that can’t be taught in the classroom. Since 2011, Team IMPACT has matched more than 1,700 children with more than 500 colleges and universities across 49 states. For more information on the program, visit www.goteamimpact.org for more information.